Baw and Heru spraying the final topcoats on the mast! This train's a‑rollin'! A great day, with lots of line items checked off although Pla and Lek were missing. The sun was out and a gentle breeze was blowing - an absolutely gorgeous day! Baw and the Indonesians attacked the wind‑blown spray tent by pulling down all the shredded bits of plastic, and re‑covering the PVC struts with cling wrap. By late morning they had enclosed the mast once again and wiped it down so Baw decided he'd spray right after lunch. Ben worked alone on polishing the pulpits and some bits and pieces of stainless steel that Sue dug up. There will be lots more of that to come. It sure does look bright! Sue headed out first thing in the morning to the big TOA paint shop near Phuket town. She took the final gallon of Interthane 990 topcoat to get it tinted "Ocelot White". She also picked up a new polishing pad, the missing thinner for the 2K paint we'll use on the small hatches and lights, and a new 2 liter set of Beger outdoor gloss polyurethane. Jon was heard banging away in the engine rooms, removing the recalcitrant anodes from the sail‑drives. Operating on the principle of "If it doesn't work, get a bigger hammer" he found an extension for his big crescent wrench (shifting spanner) and was able to free both internal sail‑drive anodes! The old anodes are not very worn away, which was both good news and surprising, given that they're about 8 years old. Nevertheless, Jon replaced both anodes anyway. Jon also finished installing the new raw‑water valves that come out of the sail‑drives. These are bronze ball‑valves that are easy to open and close, replacing the silly Yanmar screw valves that we've never been able to move at all (but were at least frozen open). 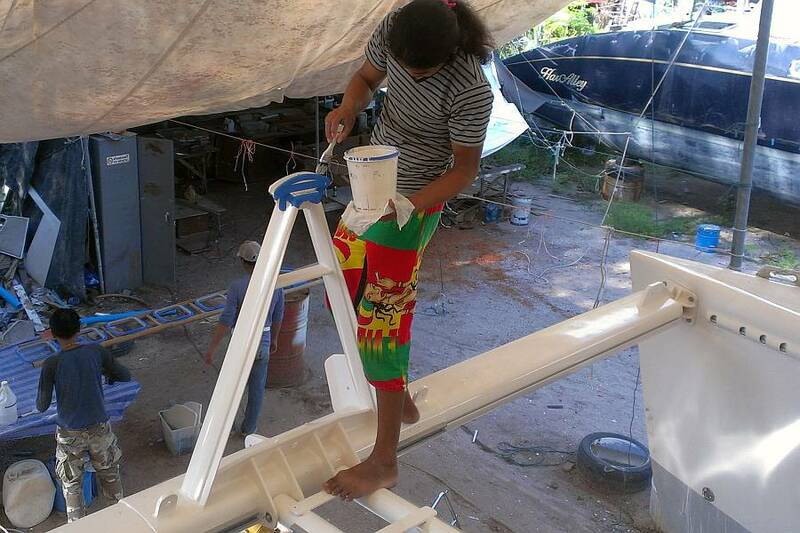 After lunch Baw, Heru and Chambron moved into "paint the mast mode". Heru and Baw mixed the tinted International Interthane 990 topcoat and donned protective gear to be worn inside the spray tent. Chambron manned the compressor. Although it was a sunny afternoon, it was not as debilitatingly hot as other days, and Baw emerged from the spray tent more perky than usual. Sue produced ice cold Schweppes lemon tonics for everyone, which were greatly appreciated. We had to remind Baw about the mast step up on deck and the top of the seagull striker on the forebeam. 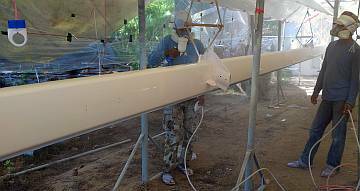 Chambron had already sanded and masked both of them, so he went out on the forebeam and got several coats of Interthane where Baw had missed it with the spray (Baw couldn't see that high), and he got the mast step nicely coated for the third time. Given that Baw often goes home after a big spray, we were surprised and delighted that Baw and the men moved immediately into setting up the silver hatches for their touch‑up paint to hide the filler on the corroded rims. This is where the 2K paint comes in. First Baw sprayed on a gray 2K primer, which dried almost immediately. Then he sprayed on the 1 part (still called 2K) metallic silver paint that'd been specially color matched at the TOA shop, and declared "Tomorrow put clear coat on top." Then he looked at his phone (clock) and said, "No. Today. Why not? Today we put on clear!" So he did! Meanwhile Ben and Yando were sanding 4 small rope locks that secure the reefing lines under the boom. These are aluminum, which is in good shape, but the paint is not. They sanded them back to primer or metal and Baw hit them with 2K primer. They will get their own topcoat later as there was none left from the mast job. Baw also spayed primer on the 2 targa bar lights, followed by a cheap aerosol spray but then strengthened with a topcoat of 2K clear. Gosh, so much happening! In the afternoon Jon moved to the trampoline project. Purists will note that the tramps are not strictly needed for us to launch, but we submit that they're a huge safety item (in fact, we're surprised nobody's fallen down there). The 2 eyebolts that held the outer aft corners of the tramps have been declared officially MIA, so Jon bought new ones at our local chandlery (Top's) for $15 each. A bit of futzing to mount them, as their old holes were invisible from the outside and unreachable from the inside, but he got the holes drilled close enough and mounted the eyebolts with silicone waterproofing. With Sue leading the way into the depths of the storage room, Jon was able to extract the big sail bag of ropes. We had (cleverly) put a note on the new trampolines that the lines for stringing them were in the rope bag. 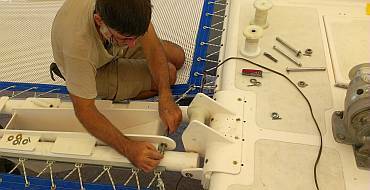 Jon worked most of the afternoon on the tramps, tying the 4 corners of each tramp to the boat and maneuvering it close to where it needs to go. He sorted and slid on the 60 plastic and metal slides that go on the forebeam and the anchor support. (The other 2 sides have the new fiberglass over PVC with a rod inside to tie to.) Then he laced the ropes, adjusted the tramp's position once again, then tightened the ropes. By late afternoon he had the starboard tramp in place and tight. Baw asked, "Strong?" "Very." "Good. I sleep there tomorrow!" Baw was the first to step on the new tramp and test the lashings. It was pretty quiet inside Ocelot with Lek, Pla and Bo absent, but it let Houa finalize the salon entryway floor and the sill above the starboard steps to the cabins. He laid the pertinent salon floor pieces to check the fit with the new sill, then used screws and Sika 295 to secure the sill . He and Yando placed most of the floor boards back in the cabins to check their fit now that they've been varnished and had epoxy on their edges. Some needed a bit of sanding and persuasion to fit nicely. 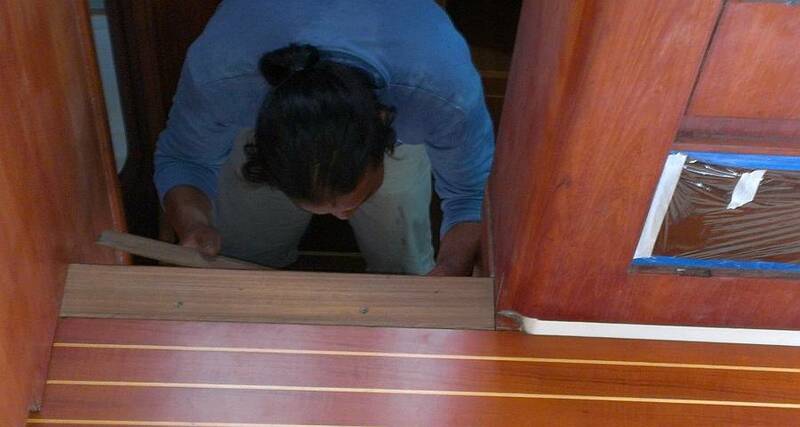 With the floorboards in place he can finalize the teak trim next to the formica on the hull. We'll be covering the floors with thick vinyl to protect them. Mr. Peh, of Chamnansin, delivered the foam for our mattresses at 5:30. Sue had checked with a local curtain/upholstery shop to see if they wanted to cover the foam but they weren't interested in using our fabric. Okay. Chamnansin (if they had time) would charge us $30 per mattress (x6, as the forward mattresses are 1 piece and the aft mattresses are each 2). The curtain shop would have charged $23. So Sue stopped in at the little hole‑in‑the‑wall seamstress who's made some nice 6‑pocket shorts for both of us, perfectly matched to our old shorts and using material we supplied. 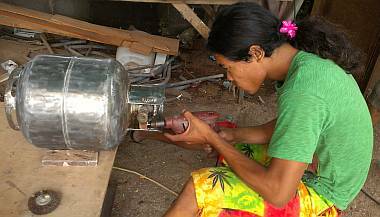 She speaks no English, but she called in her neighbor seamstress who could communicate a bit. Sue drew pictures of the foam, with sizes, and said we had the material and zippers. Price? After some deliberation she asked for $30 total. We can handle that, as it's pretty simple sewing! The great thing was that she was staying open until 8pm, and agreed to let Mr. Peh drop the mattresses off after he'd brought them to Ocelot to test their fit. Whew. What could have been a logistical nightmare (with only scooters) worked out great. A comfortably sunny day in Phuket, with a light breeze to keep things cool while work heated up on Ocelot. Baw and his team (including Lek and Pla, who were back today) spent the morning masking the salon for a satin varnish spray. The 3 words "mask the salon" are a ridiculous understatement of the incredibly finicky, tricky and painstaking job that had to be done. Because we are going to leave all the galley and navigation area handrails glossy, those bits of teak all needed to be masked off. Then there were all the lockers to close with plastic, and the windows. It basically took the entire morning. 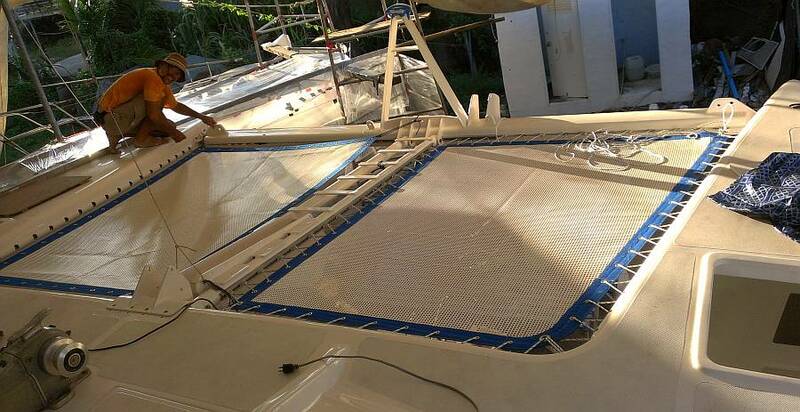 Because the interior was off‑limits, Jon spent the first part of the morning stringing the rest of port trampoline. By 10am we had a fully walk‑on‑able bow area! The tramps being done, Houa wanted to mount his fancy teak lattice over the anchor platform, but that required that the big chain rollers (well, at least 3 of the 5) be in place. Two of these were pretty beat up so we'd had a machine shop make us new ones months ago. Sue produced the hardware from the storage room and Jon worked out which ones went where. Baw's thick paint meant that the holes had to be sanded open until the pins could go through so it took longer than we'd planned. Still, it's so cool to see hardware getting mounted on Ocelot! Houa worked on his teak lattice alongside Jon. He had some cutting and fitting to do, as the anchor platform has been modified, but it's looking great! 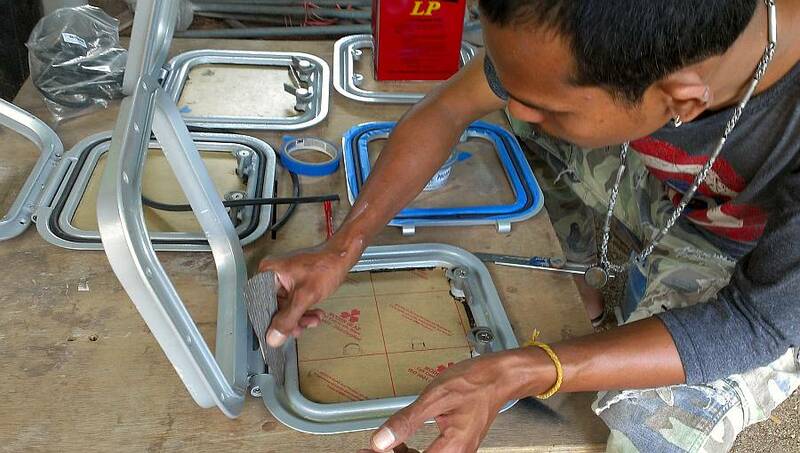 Jon drilled the pilot holes for the mounting bolts, so once Jon taps the aluminum and Houa makes his teak plugs, we should get it mounted tomorrow. Ben spent the day with the drill, polishing disk, rags, and metal polish, making bits of hardware beautiful. It was nice to have him there, ready and polishing when Jon handed him a pin to clean up, or some other piece of stainless hardware. Jon retrieved the cable for the "seagull striker" (the cable that runs above the forebeam, tensioning it against the forestay) from where it's been hanging under the neighboring boat for 2 years, and Ben shined it up. Baw showing off the results of his salon varnish spray - nice! After lunch Baw and Lek suited up for an inside spray. 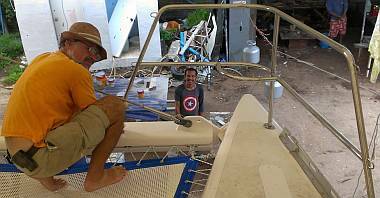 Heru manned the compressor below the aft deck. We couldn't get any pictures as Baw was entirely enclosed in the salon. But a mere 10 minutes after starting he was out and looking jubilant. "Easy, Madam," he said. "Ten minutes. No one worries. Tomorrow I spray again." Apparently he was very pleased with the spray, but there were a few little crevices where some dust was lurking, and the spraying brought the mini‑dust bunnies out. So tomorrow the men will sand with 600 grit paper, and Baw will spray Epifanes Rubbed Effect (satin) varnish again. It's looking really beautiful. 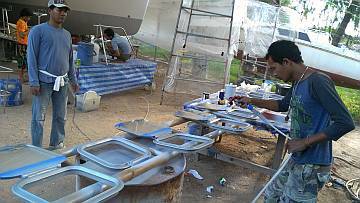 Yando and Chambron spent the morning quietly sanding the 15 pieces of interior hatch trim. These trim pieces were originally gelcoat (which is now too thin) but when Baw estimated it would take 3 men 5 days to sand and polish them if they got new gelcoat, we opted for the quick (but still beautiful) fix. Today Baw sprayed them with International Interseal 670 white primer. Tomorrow they will be lightly sanded and receive a topcoat of the same Interthane 990 polyurethane which we sprayed on the mast and boom. Then they'll be finished! Jon must have decided that life on the tramps was the place to be, as he spent most of the day up there (minus lunch on our private beach). Once Ben finished polishing the "seagull striker" (so named because it goes up, whereas a traditional sailing ship's "dolphin striker" goes down) Jon mounted it to the forebeam. Voila! We have our first piece of wire rigging in place! Sue spent the day running scooter and storage room errands. Everything that happened needed support, either items found, bought, or taken from one person/place to another. On the way out of the village in the afternoon (going to get more varnish for Baw) she skidded behind a suddenly stopping vehicle, and laid the bike down. Ouch! First time on concrete. A bit of skin missing here and there, but a good lesson in how treacherous gravel is over concrete. She did manage to get the 20 yards of poly/cotton fabric to the seamstress and learned that the plastic zippers she had salvaged form the old mattresses were not long enough. Not surprising, as we've extended the aft bunks by 3" (7.5cm), and the forward bunks are now single mattresses, so much more awkward to stuff into a cover. Unless we brought some good outdoor plastic zippers from the States last year, she'll be heading to Rolly Tasker to get more zippers. Middle of the week, and still chugging along getting numerous "small" jobs done or started. Baw had barely said "good morning" before he was immersed in applying the last bit of filler to the hatch trims which were scheduled for spraying today. Three or 4 men spent the morning sanding the primer on all the pieces, and by mid‑afternoon they were in the line‑up for spraying. Baw got a nice heavy coat of Interthane 990 Ocelot White applied, and they were set aside to dry. Baw, Lek, Pla and Heru used the morning to sand the salon satin with 600 grit, then they wiped it down and sealed it all up. Just after lunch Baw and Lek donned their gear and entered the plastic‑lined salon. Just 17 minutes later they emerged, and transferred all the apparatus and the compressor to Ocelot's bow. There, Baw sprayed satin on the 2 new rounded salon locker doors, the teak trim bits for the companionway, and some locker shelves. It's been a long uphill battle getting those rounded doors remade and looking good, but they look fantastic now. Once the salon is available again (varnish dry, plastic removed) we can mount those doors. Houa worked up on the tramps near Jon, drilling and fitting the 10 6‑mm bolts that hold the teak lattice to the anchor support aluminum. Houa got the teak mounted with Tef‑gel coated bolts, but still has to insert the teak plugs on top. Sue scootered off to Rolly Tasker to search for zippers and ask about our mainsail which they were supposed to have cleaned over a year ago. Johnnie, the main contact there, said that due to the rainy weather it wasn't washed yet, and now they're in the throes of the King's Cup Regatta. He said they can get to it on Dec 7 if that's OK. Works for us, as long as it's really ready. Rolly had the correct zippers we want for the mattress covers, and Sue bought enough to allow each zip to continue around the corner of the mattress from the long side. This should make getting the cover off and on a lot easier than a zip that stops just before the corners. She dropped the zips off at the seamstress who was ready to begin work. Sue also gave her an industrial size spool of UV outdoor polyester thread to use, and she was quite chuffed at that. Baw was clearly tired from the 3 spray jobs today, so in the late afternoon he "played" a bit at cleaning the sticky old gelcoat off the extractor fan. He would like to buy it, so we have to set a fair price. We also talked with Baw and Houa about the Goiot hatches and the fact that we were unable to order enough of the correct gasket material. Jon tried using the grinder to trim down the edges of a stiffer gasket that we've had on board for years, but it was tricky. Finally we decided to try and search for an appropriate hatch gasket at some of the chandleries. Wish us luck. Ocelot and gaskets have not been a pretty pair lately. Jon bedding chain locker hinges. HELP, it's GOT me! Thanksgiving Day, and we have so much to be thankful for! Sue made us a fun little Thanksgiving feast tonight - turkey breast, cranberries, mashed potatoes, gravy, broccoli salad, yams in orange sauce, and pumpkin pie (filling) with whipped cream for dessert. Happy Thanksgiving all! It was another day of small jobs and forward progress. Jon finished bedding down the chain locker hinges on the foredeck in the morning. Then he scootered off to Boat Lagoon, looking for some appropriate gasket material for the Goiot hatches. He returned with several samples but it was so late he came straight back to the apartment, so we haven't tried any of them yet. Sue poked away at the sail drives in the morning, to see how much of the old antifouling and epoxy coating was going to come off. Enough that it needs more ministrations. She also spent time cleaning the deck (again). Hopefully all dirt and grunge on there will all come off with a soft deck brush and a bit of boat soap and water. For now, she's just rinsing with water and a sponge to get the layer of loose grit off. Chambron and Heru spent the morning scraping away at our 2 (empty) steel propane tanks. The tanks have been sitting around for 2 years, getting more and more disreputable, so it's nice to see them cleaned down to bare metal. We'll probably have Baw spray an etch primer on them, then spray a topcoat. Ben worked on polishing things again. It's sort of nice to have someone ready and willing to polish up even the smallest fittings just before we want to mount them. But we noticed a problem with the pulpits. Their rear‑most legs have aluminum stanchion bases which bolt to the toe‑rail, and each of them has the remains of a broken‑off stainless steel bolt stuck in them. So we took them to the welders here at the yard. 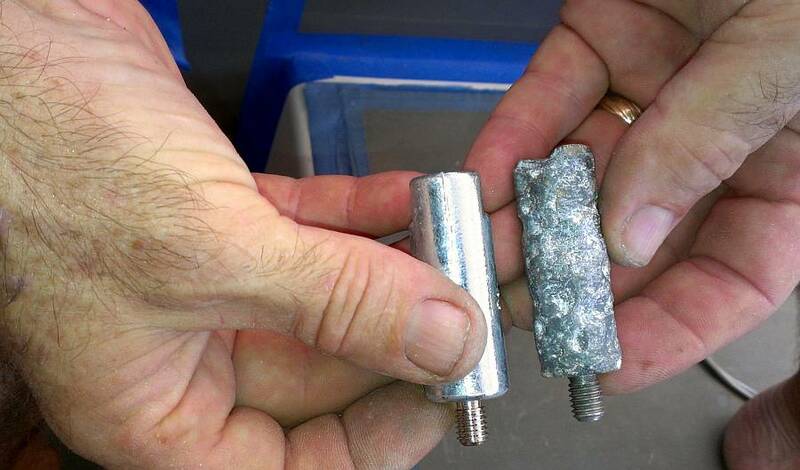 They spent several hours but were eventually successful at removing the broken bolts, and they only charged us $16. A bit of cleanup and we should be able to mount the pulpits! Lek, Pla and Baw were in the salon all morning. First they removed all the plastic masking and the tape from the satin varnish spray. Two guys worked on sanding the big hanging shelf above the fridge. This has been ignored throughout all this salon work as it is very difficult to work with. Now that other things are done, we can make a space to drop it down and work on it, although it blocks access to the fridge. Sue left the yard a bit early and Jon was off on the scooter, so we don't know if Pla got a coat of polyurethane on the shelf or not. Houa had started working on the teak strips that border the cabin floors, but when the galley masking was pulled off we remembered that we had damaged old formica just to the right of the stove. So Baw and Sue took turns playing "carpenter's assistant" using a hammer and chisel to strip the old formica from the top of the wooden counter. Once it was off, Houa sanded the wood, and Pla prepared a small cup of epoxy resin to seal the wood. Baw had another follow‑up medical visit, so he and Ben left at lunchtime. Heru finished the propane tank and asked us for more work. The main thing left is to really scrub, sand and clean the engine rooms in order to paint them. It's no one's favorite job, but Heru didn't blink an eye at the suggestion. He tried hand sanding, then gave that up. 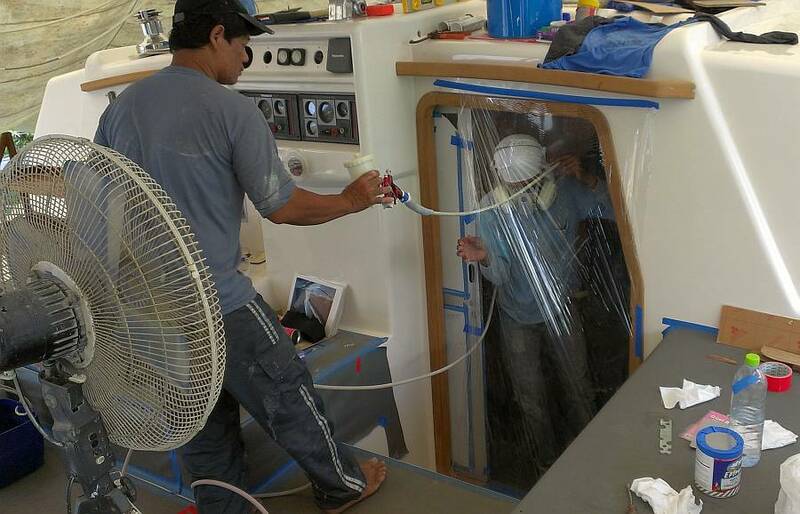 He asked permission to use the orbital sander, but we asked him to put plastic sheeting over the engine, so the sanding dust stays contained and doesn't drift into the engine or cabins. A crazy day, with so much going on, and both Jon and Sue gone for half a day (separately) to Boat Lagoon for bits and pieces. 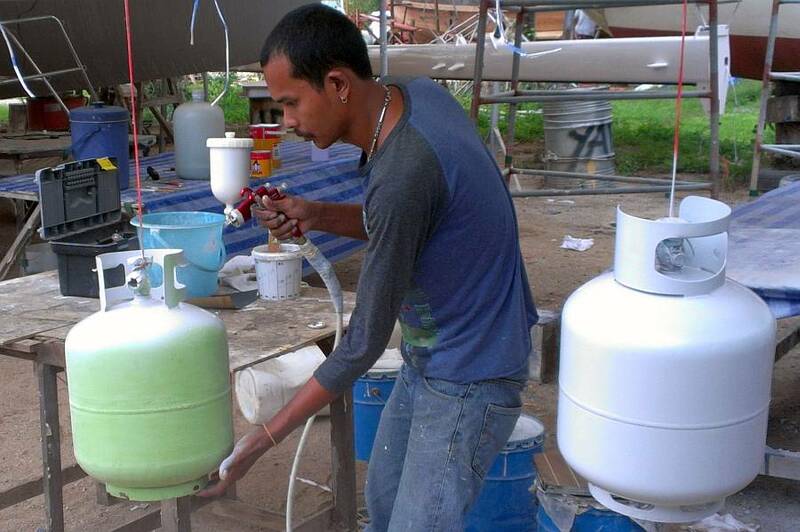 Baw dove right into the propane tank project by spraying on a lovely green coat of Awlgrip MaxCor primer. Love that color. Too bad it has to be over‑coated. By late morning the primer was hard enough that Yando and Chambron could give the tanks a light sanding. Baw wanted to spray a 2K primer on after lunch, but by then we had a rain shower, and more on the way. He chose a dry period later in the day to get the gray/white primer sprayed on. It's his idea to topcoat the tanks with the rest of the metallic silver 2K paint that we used on the small hatches. That should look spiffy! Inside the salon we had a lot of things going on at the same time. Pla and Lek did a final sanding on the oval shelf above the fridge and got not just one, but 2 coats of polyurethane on there today. Houa asked Pla to sand the epoxy on the galley shelf where the formica will go. And somehow, with all of that Baw managed to brush on a new topcoat of gloss polyurethane varnish on the entire salon handrails. This is the final polyurethane coat. Tomorrow it will get some fine sanding and then polishing to give us a lustrous finish on the trim. Houa got the new formica piece all sized and cut out, and sometime in the afternoon (when we weren't looking!) he epoxied it down. This area to the right of the stove gets a lots of water and abuse, and it will be well served to have epoxy under the formica instead of the more normal rubber cement. Houa also got the floors sorted out in the port forward cabin, and decided to fill the new gap (left from taking out 8mm plywood on the hull) with epoxy and filler. He had planned to fill the gap (under the solid teak trim) with plywood coated in epoxy, but realized that was asking for trouble, hiding plywood under the floor like that. With the epoxy and filler we won't be able to remove the stringer adjoining the new filler but at least the teak trim by the floor will be on a solid base. Under Houa's direction, Lek mixed and filled the gap. Tomorrow, 2 more cabins will receive the same treatment. 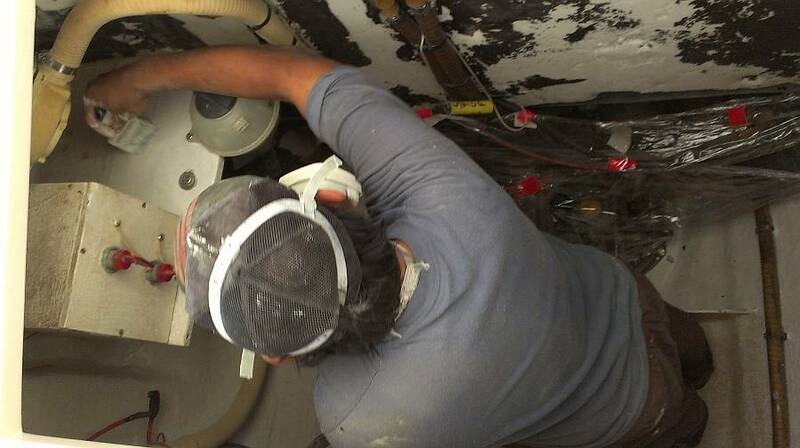 The biggest jobs of the day were the sanding and cleaning of the engine rooms. Heru started on port yesterday, putting plastic over the actual engine to keep the dust from migrating forward into the machinery and the cabins. 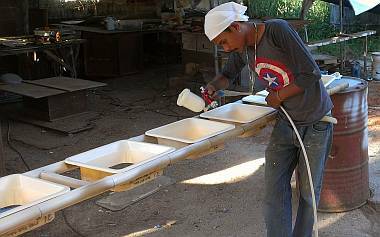 Today he used the orbital sander to prepare the hulls and bilge. By the afternoon, he'd applied a coat of Jotun Penguard HB primer. This is a 2‑part epoxy primer and could be left as a top coat if we wish, but it's not very glossy, so it gets dirty easily. We intend to topcoat with 2 part Jotun Penguard Enamel which is supposed to be very resistant to chemicals, petrochemicals, and salt water. Pla jumped in and took on the starboard engine room. We tried to impress on the guys that we didn't want to see any splashes of paint on hoses, wires, or equipment in the engine rooms. (Tomorrow we'll do an inspection!) Pla got some of the port engine room coated in primer, and will be finishing it tomorrow morning. Ben was still the polishing king. He finalized the pulpits, now that we've gotten the broken bolts out of the stanchion bases. He polished up the feet for the helm seat and began to work on the bases for the salon tables. Other polishing happened up on deck, where Yando and Chambron each took on a stanchion. It's so frustrating to see how our boat was abused by careless workers last year. The men had to use razorblade cutters to chip off the accumulated epoxy coating that was deposited on the stanchion by thoughtless workers who grabbed the stainless steel poles before wrapping them in plastic. 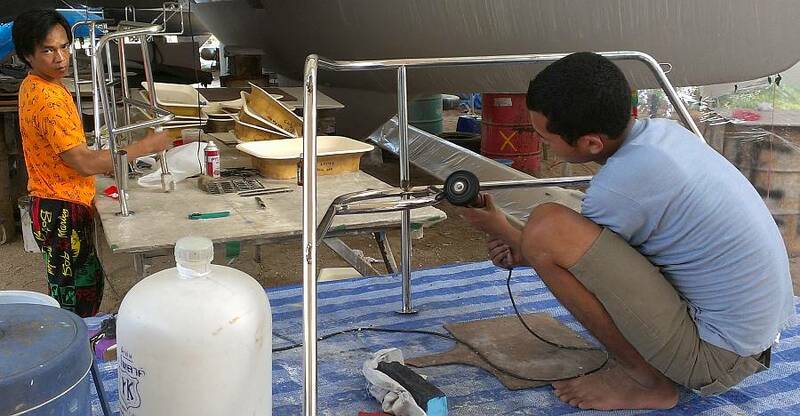 On starboard, Ben was able to polish some stanchions with a clever trick. He wrapped a long cloth (with polishing paste) 1½ times around each part of the stanchion and then pulled it back and forth, producing a nice polishing action. 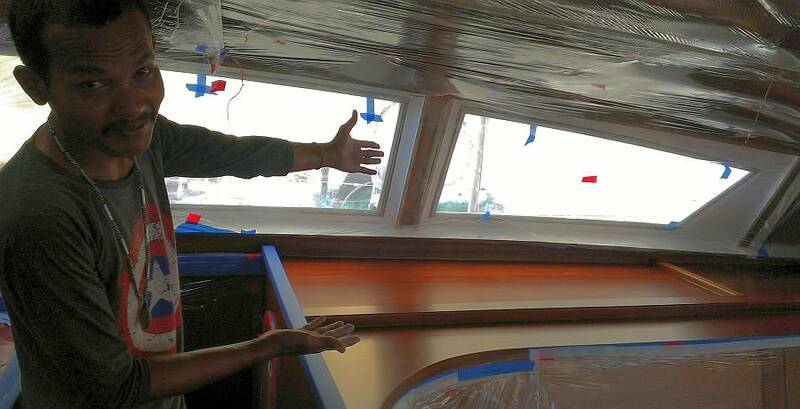 Jon and Sue discussed gasket options for the 10 small deck hatches. 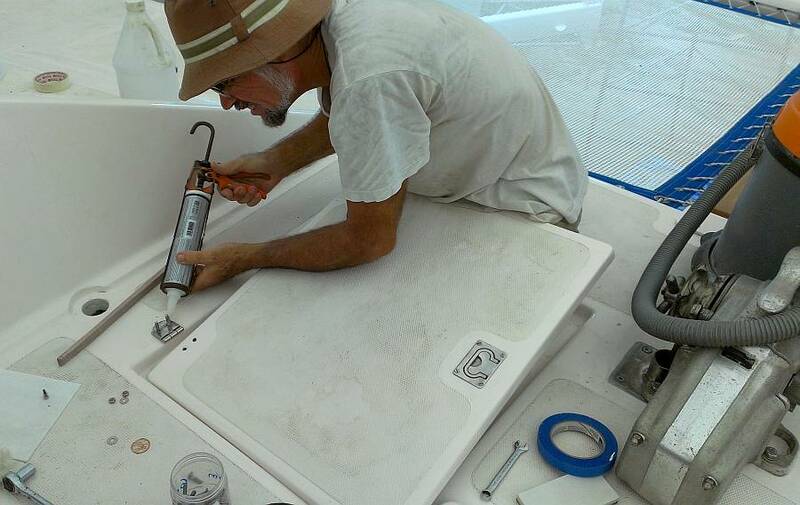 Yesterday Jon brought back 5 sample gaskets from around the Boat Lagoon area and today we chose the best fit. Then Jon scootered off to Boat Lagoon (AME) to buy 10 meters of it. Unfortunately, the sales woman at AME had been hasty in grabbing the gasket bags, and Jon assumed she had checked to be sure they matched his sample. But no, we ended up with the wrong material! So after lunch Sue scootered back to Boat Lagoon (30‑40 minutes each way) to get the correct gasket material and some new 316 stainless bolts for the pulpit seats (but not before we got to Skype the kids for Thanksgiving at Jon's sister's house). Jon's afternoon project (since he couldn't work on hatch gaskets) was to get the hinges mounted on the new tank lockers up on the foredeck. Easier said than done. Turns out the custom built hatches didn't fit exactly right, and so he had to sand them here, there, and a couple other places so they would sit flat. Different workers had built the port and starboard hatches, so Jon had the fun of trying to make them both look and work the same. After much fiddling he got the hinges mounted and silicone bedded on both hatches late in the day. Next step is to create gaskets for them, probably using a thin rubber, as the inner rims are quite narrow. The end of another good week, and we still kept our 7 workers busy and productive. There's lots of joking about launching Ocelot in a few days! Not going to happen, but we're getting closer all the time. Heru and Pla deserve the Good Guys Awards for the day. From the moment they arrived until clean up time at 4:45 they were in the engine rooms. Heru was in port, and was a few hours ahead of Pla in that he began the day with only a small area still needing primer - a section on the outer hull side of the engine, far forward, where he could just reach. He spent the day sanding the primer and applying Jotun Penguard Enamel topcoat. Pla had lots more primer to put on, but he managed to get the whole starboard engine room and the walls and ceiling coated in Penguard Enamel as well. Pla wore a full chemical mask but his eyes were red by day's end, even with the big fan over the engine room hatch. Heru wore a face mask, but had the smaller extractor fan going for him. Both of them did marathon jobs and we're so grateful. Baw asked if we wanted a second coat of enamel but a good primer and topcoat should be just fine. We just hope that the preparation work was meticulous and that the paint sticks! Yando moved from small job to small job all day. 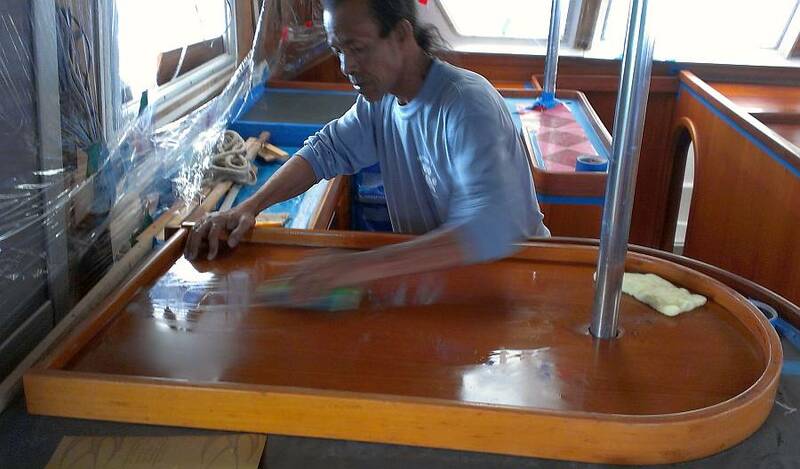 He was often seen polishing stanchions or bits of stainless steel on the deck or the base of the targa bar. He also attacked the gelcoat frame around the inside of the old emergency hatches, getting it wet sanded up to 1200 grit sandpaper and heading for 2000 and the polisher. This wasn't even on our Things To Do list, but Baw found it and we were happy for it to happen. Yando's heroic effort came after a massive thunderstorm at 3pm that drenched Houa's woodshop when part of his plastic tarp roof shredded. When we offered Houa another plastic tarp to protect his workshop, Yando was the one willing to climb the tent poles and perch 10' (3m) in the air to tie the new tarp in place. Chambron followed up on yesterday's request by Houa to sand the teak winch base on the port side of the cockpit. He got it nicely smoothed down, and with tape around the gelcoat, got the vertical sides done as well. Then, when we weren't looking, he mixed up some epoxy and liberally coated the entire teak platform. Jon saw this, grabbed his head, and said, "Oh no, Mr. Chambron. No epoxy outside!" Well, it turns out that Houa's idea was that the epoxy would fill the old dry cracks of the teak, and the rest would be sanded off, so none would see the sun. But Jon's dramatic response to the epoxy became the joke of the day, with Baw and others imitating Jon and his gestures and words, to everyone's glee. 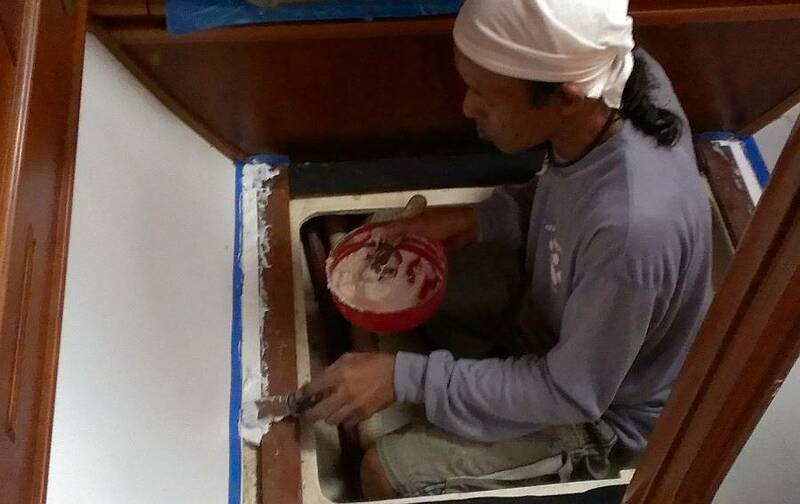 We thought Lek would be sanding the oval shelf above the fridge but he kept busy with smaller projects. Houa got him to assist in mixing epoxy and micro‑balloon filler to fill the gap next to the floorboards in the cabins. All 4 cabins are now finished with that phase of the floor. 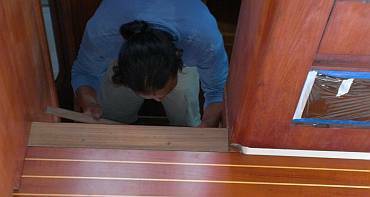 Lek also got the 2 removable steps to the cabins sanded on their bottoms and coated with polyurethane. Somehow that had slipped through. Baw spraying our gas bottles with silver 2K - they look new! 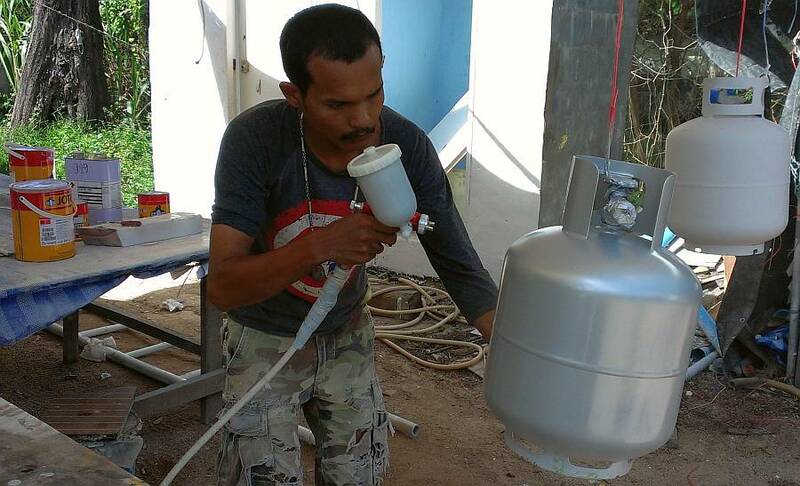 Baw began the day by sanding the gray primer on the propane tanks, then spraying on the metallic silver 2K paint. We thought he would wait awhile for the final clear topcoat (allowing us to stencil OCELOT onto the tanks, but he sprayed very soon after the silver was dry. Sue tried to find English stencils at the (very complete) stationary store across from our apartment, but the only stencils were numbers or Thai letters. Time to create a stencil on the computer. Jon tried to remove a broken stanchion base that's still attached to the toe‑rail but the bolts wouldn't budge, even with heat. So he got out his (Chinese copy of a) Dremmel to cut the bolts out, but the little collet inside the chuck that holds the bits fell apart. <sigh> New ones are available, but only on the far side of Phuket town, so that job's now postponed until we're going that way and can combine errands. So Jon turned his attention to the stanchion bases of the pulpits. The yard's welders removed the broken bolts that were stuck in there, but the threads were pretty trashed afterwards. 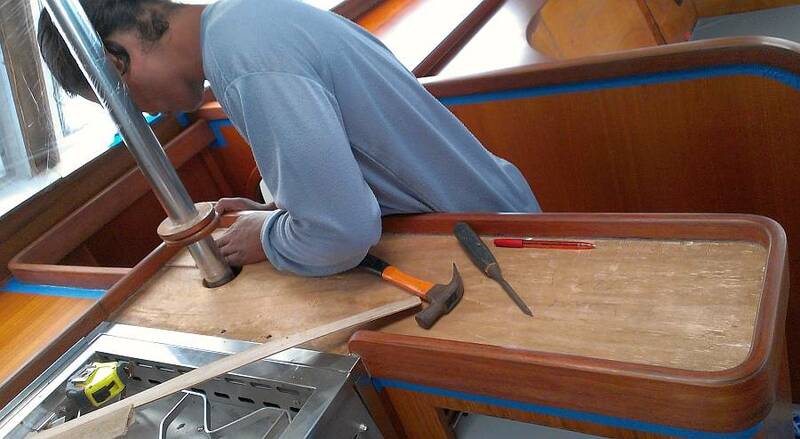 Jon was able to clean the starboard one up by re‑tapping the hole, but the portside pulpit will require the hole be drilled out and re‑tapped for a larger (10mm) bolt. Our other big project came in the afternoon. 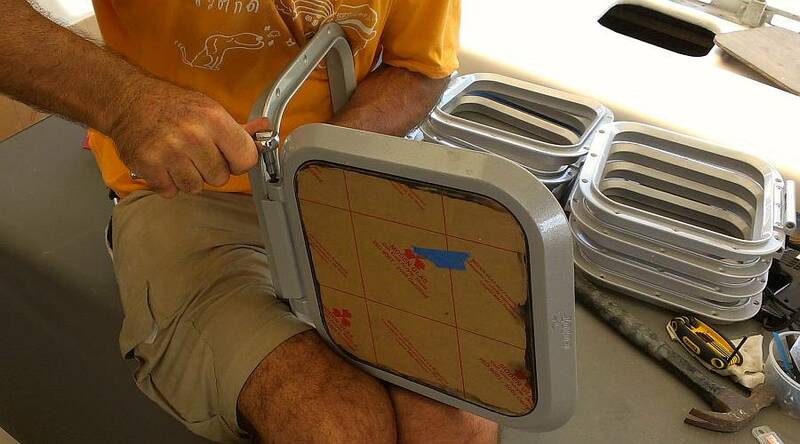 Now that we have the new gaskets for the 10 small deck hatches (thanks to the 2 Boat Lagoon trips yesterday) Jon assembled the tricky "friction" hinges on the remaining hatches. It's a complicated process involving pieces of hand‑machined rubber tubes inserted into the hinges and compressed by bolts and special hand‑machined washers, but he got into a rhythm with it. Once the 10 small hatches were assembled, Jon called Baw over for some brainstorming on how best to fit the round gaskets into the U‑shaped gasket channel on each hatch cover. The trick was to get Dunlop rubber cement down in the bottom of the U without touching the sides, and to have the corresponding rounded edge of the gasket coated in rubber cement, but to not have the 2 surfaces touch and stick prematurely. Jon made a couple of small rubber tools to help sand the bottoms of the gasket channels, then Baw came up with a great idea. 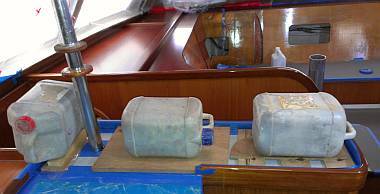 He used blue tape to line the U‑shaped gasket gutter on an extra hatch cover, then he pressed the new gasket in, and with it held firmly in place he could apply the wet rubber cement without the gasket rotating or twisting. Jon made him a plastic tool to smear the glue into the bottoms of the gasket gutters. Once this set up was in place, Baw kept 2 gaskets going (1 wet and 1 dry) and 2 hatch covers, so that he barely had any down‑time while waiting for the cement to dry. He was working on hatch #9 when the heavens opened and we had a short but violent thunderstorm. He had to pull apart his last hatch because of all the water, but luckily he could clean up the gasket and re‑use it, thus saving us another trip up to Boat Lagoon (and another $20). Next step: mounting the hatches to the deck on Monday. Sue did a lot more management stuff today, working on old bills and payments due. Not fun. She also got more time in the storage unit where she pulled out about 30 pounds (14 kg) of rigging turnbuckles and forks. Ben's eye's lit up when he saw it all. 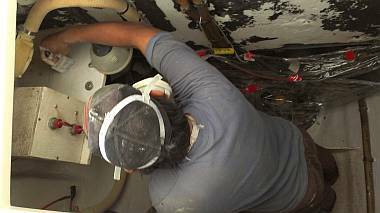 No doubt he's enjoying the role of machine polisher, and it is certainly a nicer job that being thrown into the bilges or engine rooms. Jon's last coup of the day was to get the forward‑most leg of the starboard pulpit bolted to the forebeam. None of the guys knew where the pulpits went, so they were very interested. It looks like the slight forward position of the forebeam will not unduly affect the position of the pulpit and its legs. To protect the aluminum forebeam from the dissimilar metal corrosion of the stainless steel pulpit base, Jon cut a small disk from a scrap of fiberglass. He used Tef‑Gel corrosion inhibitor on the stainless bolts (which thread into the aluminum forebeam) and slathered both sides of the fiberglass disk with lanolin grease in an effort to prevent salt water from getting under the pad. It looked so good he cut 5 more round insulation disks to use elsewhere, on the theory that setting up to make them is most of work. Inside the salon Houa's new formica looks great. He created a small teak strip to cover the formica seam, and he did a bit of fiddly carpentry work to slip a bit of teak into a gap where the old teak frame is just too short for the counter. 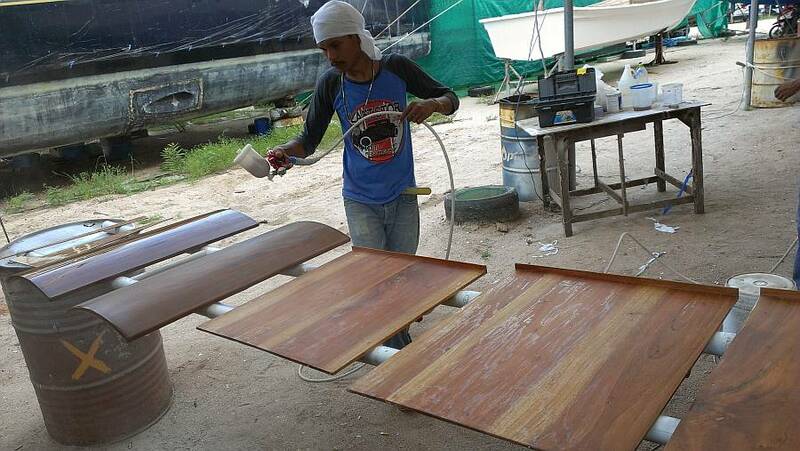 He spent most of the day on the teak trims by the formica kick‑boards in the cabins. These pieces will be epoxy coated (for water resistance) before being mounted permanently.